Note that there is a bug for this that has been marked Won't Fix. Needless to say, this design is still at a very rough stage. The main window is essentially a profile manager (I'm calling profiles 'Backup Plans'). The existing 'Connect' dialog has been incorporated into the new profile dialog. An effort has been to make everything work according to GNOME's instant apply convention. This creates one potential issue - the dialog has to be quite high to allow for the potential display of these settings. In many situations, the result is large amounts of unused space. The use of bookmarking has been removed - this needs to be discussed. 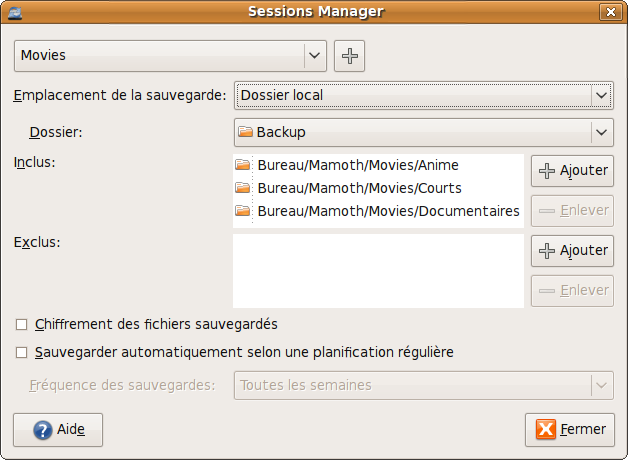 'Backup plan' sounds a lot like 'Fallback plan' to my ears, which confused me for a second, initially.